Noble bears a striking resemblance to the chestnut I once coveted. It was a hot July evening. We were heading to the barn for my lesson, and I was excited. Andrew Jackson was now living at the stable where I rode, and there was a good chance I’d be riding him on this night. Andrew was a tall rawboned chestnut Thoroughbred, of the sort you don’t find very often any more (at least not in the U.S.), but was rather common in those days. He had a long head with a handsome blaze, and several white socks. Andrew had been a young girl’s Eventing horse, competing at least through Preliminary, but he was now for sale. We could never afford him, but I still dreamed of tackling cross-country on the back of this tall, sturdy chestnut. As we pulled into the driveway, there was a small group of adults standing around a little white horse. He looked like an overgrown Shetland, with his round belly and bushy white mane and tail. I wasn’t even curious about the new horse – my mind was set on getting Andrew out. As I got out of the car, the adults motioned for me to come and look at the little white steed. They began asking me what I thought of him, and didn’t I think he was cute? I just shrugged. Apparently not satisfied, one of the adults told me to watch him move. She sent him out on a long line around her, asking him to trot and canter. He was rather out of shape, and out of balance. He was certainly no Andrew Jackson! 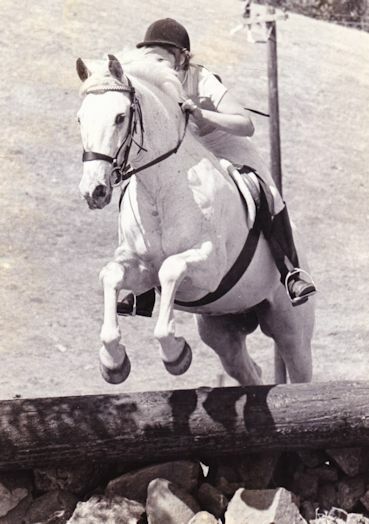 I was puzzled by the interest in this horse, when someone (can’t remember if it was my mother or another woman) let the cat out of the bag – this little white overgrown pony was my new horse! “Oh” was my only response, as they handed me the lunge line. Disappointed looks on adult faces all around! It’s not a moment I’m proud of, but when you’re twelve and dream of a tall handsome chestnut, and someone hands you a dumpy little white horse who could have walked out of a Thelwell cartoon … even as an adult, I have trouble making that sort of switch gracefully! Wicki was the best “first horse” any kid could have! Lest you feel too sorry for my mother, or for the little dumpy horse – all ended well. Life might have been very different with Andrew as my horse – but he might have been wasted on my at that stage. Sure, I jealously watched others get lessons on him, for a few weeks, while I rode my little “pony” – but that little white horse was probably the best thing that could have happened to me! He taught me so much, and we had great times together. This weekend, I was thinking of that moment when I first met Wicki – and how life seems to have come full circle. 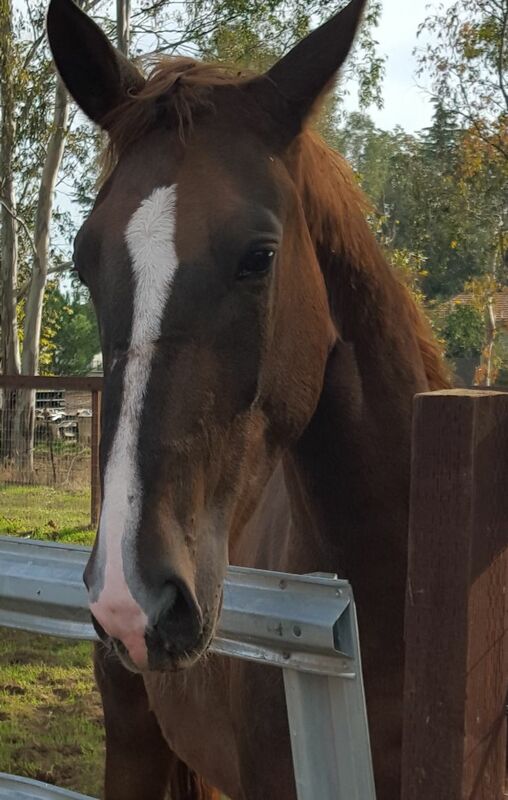 I now have the tall, handsome chestnut with the white blaze and socks that I’d dreamed of as a child. In some ways, I feel a bit like the middle aged man who couldn’t afford the Mustang convertible when he was a teenager, so he buys it later in life to fulfill that unfulfilled fantasy. Only my convertible talks to me, follows me around, and breathes in my ear. This entry was posted in My Journey and tagged best horse, first horse, life goes full circle, the horse you need, the horse you want, Wicki. Bookmark the permalink.